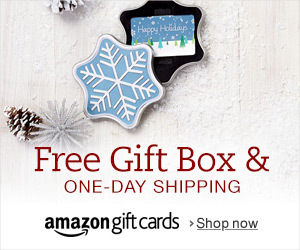 In this holiday month Amazon offers a dozen gift box designs for Amazon gift cards. The plastic gift card is nested inside a beautiful gift box for free one day shipping. Gift cards in free holiday stockings is also in the selection, or just in holiday greeting cards with separate mailing envelopes. Click to benefit from favorite gift box designs and send your beautiful greeting right now >>> Now make Dad’s Day 2017 with a gift card!